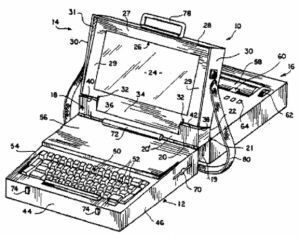 Here’s the groundbreaking granddaddy of all clamshell-style laptops–Grid’s Compass 1101, which also sported other, less lasting innovations such as a plasma display and bubble memory. 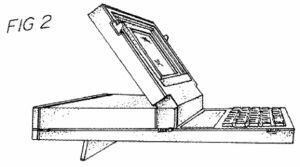 The hinge was in the middle rather than the edge, but machines such as the TRS-80 Model 200 soon changed that. I wish my MacBook Pro had a fold-out foot like the one seen here. Okay, I understand that not every portable computer can be a wafer-thin MacBook Air. But this one seemingly combines an Apple II-like computer with a superchunky display with an Epson FX80-style dot matrix printer–it looks like it would have made for a machine that was around eight inches thick. I make no guesses about how much the whole contraption would have weighed, but I bet the shoulder strap depicted in this illustration was there out of necessity. 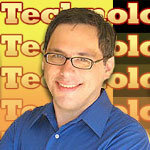 technologizer aren, computer, computer patent, dot matrix printer, folding screens, google patents, laptop computer case, October, portable, technologizer. permalink. Font is fine on mine and I have 76 year old eyes with macular degeneration. Font size is adjustable is it not? Re: Greg. Have you tried pressing Ctrl, then rotating the scroll wheel? This should enlarge whatever you are looking at. could you please use bigger fonts. my god one has to have better than 20-20 to read these articles.